Head to the wild west with one of the 20th century’s most influential composers, Aaron Copland — a man who achieved a distinctive musical characterization of American themes in an expressive modern style. Get lost in two of his most popular and widely performed pieces Billy the Kid and Appalachian Spring (for which Copland won a Pulitzer in 1945). 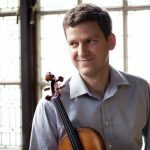 The night features violinist James Ehnes. Considered one of the most dynamic and exciting performers in classical music, Ehnes has performed in over 30 countries on five continents. This eclectic evening is sure to delight.